An HVAC brand is more than just a logo, slogan, and catchphrase—a “brand” is what your customers feel or think when they see or hear those things. In order to make a mental connection with your customers, you’ll need to develop a personal, emotional, and social brand identity. Once you establish what your HVAC brand is all about, you can start standing out against your competition, build long-term relationships with customers, and drive business growth. Need a little help? Here are our best 19 tips on successful HVAC branding that you can use to give yourself a competitive edge. Click on a link below to learn more! Let’s take a deeper look at each of these steps in the sections below. To build a brand, you have to create an HVAC logo, slogan, and catchphrase to live in the minds of your customers. You’ve heard it before—first impressions are everything. And it all starts with your HVAC logo… so how will you choose to be seen? Our brains process images 60,000 times faster than words, which is why most HVAC brands choose to include a visual or glyph in their logo. Tip #1: Be memorable in the best way possible. 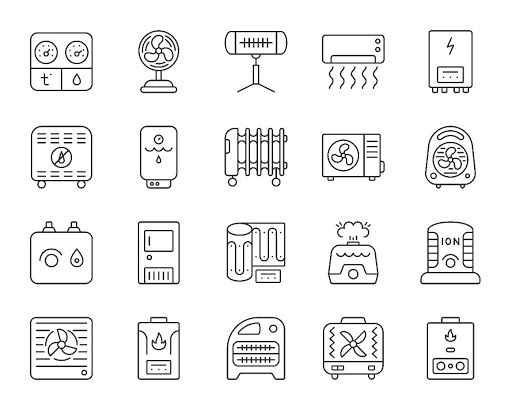 As cliché as it sounds, originality is everything when it comes to your HVAC logo. You’re better than those other guys, so don’t be like those other guys! Businesses within this industry tend to gravitate toward the same design concept. You’ve seen it before: generic air conditioning logos, HVAC clipart, those obvious red and blue arrows in a circle… These designs have no shot at being unique and going down this route will just make your business seem like a dime a dozen. Note: If your HVAC logo contains clipart, it can’t be trademarked, meaning other companies can steal your design. We highly recommend hiring a graphic designer instead. Go in a different direction and make your logo memorable to your current customers and catchy for your new ones. However, you don’t want to be remembered for the wrong reasons with an unattractive or offensive design, so be sure to consider these tips when it comes to originality. Sound slightly confusing? Let us give you an example. Your positioning statement is essentially how you want to live in your customer’s mind. Take this message into consideration when picking your elements (text, icons, etc.) color choice (calm, cool, and professional or bright, vibrant, and fun? ), and font style (bold, minimalist, or silly). Your HVAC logo is your brand identifier so it should give people an impression of what your company is like, and it only takes 10 seconds to form a first impression of a brand’s logo. Less is more. Don’t cram too much in there; not only is it distracting, but it won’t translate well across different sizes and mediums. Tip #2: Your HVAC logo should say something; use it to communicate before you get the chance to speak to the customer. Remember those commercials you used to watch on TV and can probably still recite the phone number by memory? They probably sang the phone number to some catchy tune during the outro along with one final punch line before signing off. Those marketing legends will live on forever because their slogan will never die. What’s the message you want to leave behind? Tip #3: Your HVAC slogan reflects your company spirit. If you strive for precision and perfection, a confident and declarative slogan is the way to go. Is your HVAC brand more customer-focused and community-oriented? Then a fun play on words might be the better bet. Slogans are designed to be catchy and repeatable—think of Kit Kat’s “Give me a break”—so use your creativity here! Whether it’s a jingle or a phrase, it should immediately come to mind when customers think of your HVAC brand. Need some examples to kick off your HVAC slogan? After thinking of some great ideas for HVAC slogans, make sure to include it within your marketing campaigns so that people start to catch it like a virus! Sometimes known as a tagline, your HVAC catchphrase is a little different than your slogan. Whereas the slogan tends to be more about the product, the market, and a customer’s needs, the catchphrase is usually centered on the company itself (like Apple’s “Think different”). Tip #4: To come up with an HVAC catchphrase, look for unique angles within your brand. Think about your position within the market, what makes you different, how you’ve evolved, where you came from, so on, and so forth. By examining your company history, you can articulate your brand’s promise and from there, develop your tagline. It’ll be used less frequently than the slogan, but it’s far more powerful. Take some time with this and try on a few different ones for size before committing. You’ll know when you find the right one. At the end of the day, try to convey authenticity and transparency—94% of consumers say those qualities make them more loyal to a brand. Tip #5: You can change your HVAC slogan as many times as you want with to adapt to the market, but your catchphrase should be a part of your brand identity for at least a generation or more. After coming up with your branding materials, you’ll need to spread them in order to maximize your visibility and gain recognition. That means taking your HVAC logo, slogan, or catchphrase and plastering them anywhere you can get some exposure since it takes 5-7 impressions for customers to recognize your logo. … the list goes on and on! But before you get ahead of yourself and make your HVAC brand known, you need to come up with your brand’s identity—not what you look like or what you say, but who you are. Otherwise, people may see your brand around town, but without a mental connection in their head, your brand won’t illicit any type of emotional response. Tip #6: Build your brand identity before creating your marketing materials. How do you choose the brands you give business to? While it’s probably a combination of factors—price, availability, good customer reviews—at the end of the day, you probably choose a business because you feel good about them in one way or another. Likewise, you need to build a positive image for your company. Be sure to hop on any negative review as soon as possible; 57% of people say unaddressed negative reviews are a good reason to “break up” with a brand. These are the same values you want to project in your brand’s personal identity using your HVAC logo, slogan, and catchphrase. But the key is that you need to be genuine in how you present yourself! Tip #7: Personalizing your brand helps you build a positive image and connects you to your target audience. It can be a challenge but don’t be intimidated. Here are some ideas you can use to make building your personal HVAC brand a whole lot easier. Create a mission statement that clearly identifies your HVAC brand and why you do what you do. Tip #8: Your business should be more than just an ends to a means; identify your personal HVAC brand by making your purpose and motivation clear. Imagine yourself opening a magazine. A picture catches your eye and the first sentence feels packed with emotion. “Laurie and her late husband raised their children in the home they owned for over 57 years. The weather forecast said they were out of the hurricane’s destructive path, but…” You’re drawn in, hanging onto every punctuation mark, and don’t even realize until you reach the end… that it was an HVAC advertisement. Bullet points look great on resumes, but your customer wants to be drawn in and engaged. Did you know that over half of readers spend less than two seconds looking at an email? If you want to capture their attention, hook them with a great opening line then hit them with all the information they didn’t know they needed. Tip #9: Telling personal stories helps engage your audience and communicate your identity. Don’t worry, you don’t need to be a creative writer to sell your story—personal testimonials from happy customers work just fine! Take some of those great reviews and broadcast them with a Testimonials page on your website (if you don’t already have one, now is definitely the time to build a website for your HVAC brand). Hearing about how you worked outside of business hours to help someone get their A/C back on during a hot summer night could be just the trick for converting a lead into a customer. Unless you’re in the commercial HVAC business, chances are that you install units in residential homes and service everyday homeowners in your neighborhood. Show them that you care about the community you serve by giving back! Can you sponsor a youth soccer team? Spend time volunteering? Whether it’s money, time, or resources, your contribution won’t go unnoticed (and neither will the HVAC logo right next to your name!). Tip #10: Getting involved with the community you service shows customers that you care about people, not just profits. People want to give their business to companies they feel a connection with—which is why it’s important to develop your personal HVAC brand. Once they know who they are and why they should hire you over the next guy, you can begin to develop your emotional brand identity. Forging strong emotional ties to your brand builds customer loyalty and increases your sales. By establishing that connection, you can charge 20-200% more than your competitors. Here’s how. Annoying as it may be, this strategy is successful. Keep asking yourself question after question until you get to the deepest possible motivation for why people need you and your service. It’s the best way to discover the right emotional connection you should strive to build with your target audience. The result of this process helps you identify the emotions (comfort, lack of frustration, quality of life) that you should appeal to in your target audience and use within your marketing strategies. Tip #11: Before you can build an emotional brand, first you need to distinguish which emotions you want your brand to evoke. Tip #12: Choose your target audience and talk about how you can solve their frustration. If you follow through on your brand promise, you’ll gain trust and your customers will be exponentially happier. The next time they feel like you can solve something whatever’s bothering them, you’ll be their first call. For old school, Mom and Pop-type businesses, converting over to the digital world can seem anywhere between a welcome challenge to an awful task—especially if you’re not fond of the social media craze that’s taken over by storm. Unfortunately, whether you like it or not, you need to keep up with the times and expand your profile in the Yellow Pages to social media profiles on Instagram, Facebook, and Yelp (at the very minimum). Tip #13: Put your personal beliefs about social media aside to pursue business opportunities. The more platforms you’re on, the more places users can find you. Most of these accounts are free, so why not take advantage of them? If you offer an online booking service that’s integrated with your social media accounts, users can simply book within the app or website they found you on, as opposed to exiting, navigating back to the search bar, trying to find you once more, and potentially clicking on a competitor who paid to get an ad placed above your search result. This translates into an easy user experience for them, and a happy customer for you. A positive experience pays off! In fact, 66% of US consumers are willing to pay more for a product if the brand can consistently deliver positive ones. Tip #14: Deliver on your HVAC catchphrase by making your customer experience stress- and hassle-free. Be selective with the pictures you choose to post or share on social media; they should all be consistent with your HVAC brand image. If possible, choose a unified theme and color palette. Do you want your pictures rich with natural light set in beautiful homes? Are you going for a no-frills, down-to-business type of aesthetic? Will you include your HVAC logo watermark in all your images? Think these things through before you start posting hodgepodge photos that will confuse your audience. Tip #15: To establish a clear brand, make it a goal to keep your social media image consistent. When you post on social media, you’ll have plenty of opportunities to fill descriptions and captions. Use this as your time to shine! A caption that reads, “Best HVAC tech in town” doesn’t say anything unique about you. Express your originality with a caption that says something like “My dad showed me how to work on our air conditioning unit back when I was a little kid and I’ve been obsessed with HVAC ever since. Today, I got to bring my son to work and by this look on his face, I think it’s fair to say he loves it, too!” Tidbits like that are guaranteed to leave an impression and deepen your connection with your customers. Tip #16: Make every word count! Generalizations are your enemy when creating a unique HVAC brand. The importance of using social media to build your HVAC brand can’t be stressed enough! Considering that 95% of adults between the ages of 18 and 34 follow a brand via social networking, you could be losing out on a ton of business opportunities if you don’t make yourself known online. Now that you have a strong brand in place with your unique HVAC logo, a memorable slogan, signifying catchphrase, and recognizable identity, it’s time to get yourself out there! Use these HVAC business marketing strategies to leverage your brand and watch your business growth explode. There are endless ways to advertise your HVAC brand, some of which are more or less successful. These are our top recommendations for the best return on investment. If you want to make your business known and build brand awareness, then you need to make your company easy to find online. The first thing a customer will do when they need a furnace repaired or A/C serviced, they’ll hop on their phone or computer to do a quick Google search for technicians in your area. Search engine optimization (SEO) is a must if you hope to get your business near the top of the results page and attract potential leads. If it’s not within your budget to hire an SEO company who can audit your website and build backlinks to your page, don’t be discouraged. You can boost your online presence all by yourself using content marketing for HVAC businesses. Tip #17: SEO content marketing is a great strategy to build brand awareness and increase customer acquisition. All you need to do is create a blog page on your website and use it to post content on a regular basis. Aim to write at least four blog posts per week; you can receive almost 3.5 times more traffic than companies who publish fewer than four monthly posts. Don’t know what to write about? You’re full of information and experience—share it with your readers! Offer explanations, product reviews, industry news, and so on. Remember to include all the right keywords to improve your rankings. That way, the next time someone searches a query such as “Why is my drain pan leaking?” you’ll be there as a resource. By answering their question, you establish yourself as an expert in your industry, gain their trust, and create an awesome sales funnel. It turns your HVAC brand to the end-all, be-all solution for heating, cooling, and refrigeration needs. What better way to attract people to your HVAC brand than by offering promotions with awesome savings? If it’s not feasible to offer discounted services right now, you can still offer promotions such as referral programs, incentives for your returning customers, and raffles for products branded with your HVAC logo. Tip #18: Everyone loves a good deal! Show your customers that your brand offers tremendous value by running occasional promos. We just hit you with a ton of information on how to grow your business with an HVAC brand. If your head is spinning and you want to make your load a little lighter, automated HVAC marketing is an amazing solution. Housecall Pro makes marketing a breeze and helps keep customers informed by reminding them of upcoming jobs with automated emails. You can also send automated postcards right to customers’ doorsteps in order to stay at the top of their minds. Keeping in touch with your customers—without having to think about it—is great for your HVAC brand and helpful for your heavy workload. Tip #19: With automated marketing, you can worry less about communication and more about building your HVAC brand. Housecall Pro’s HVAC software provides solutions for not only marketing but also booking, scheduling, invoicing and more. When business starts to boom and you and your brand becomes the go-to choice for your service area, we can help you keep up with the demand.